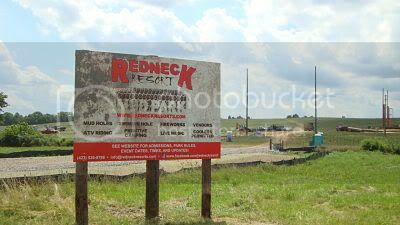 ATV RIDING, MUD HOLES, SWIMMING HOLE, LIVE MUSIC, VENDORS, COOLERS PERMITTED, PRIMITIVE CAMPING at the Redneck Resort Mud Park. off of I-75 exit 60. I love to ride an ATV but I can do without the mud....but to each it's own. I hope they have some good live music coming to our area. Did you happen see the 'rednecks are the last true Americans' quote?